Two goals in the final two minutes on Saturday earned a draw for Dallas against visiting Sporting Kansas City and prevented their first home defeat of the season. Dallas were unlucky not to score in the first half, and SKC took the lead just before halftime through a Kei Kamara penalty kick awarded after Andrew Jacobson tugged Aurélien Collin’s shirt in the box. An own goal in the 57th minute compounded the bad luck for Dallas as a Graham Zusi corner took a bounce and ricocheted off Je-Vaughn Watson into Raúl Fernández’s goal. In the 68th minute, though, C.J. Sapong was given a red card for knocking a ball at Jacobson, who was down on the ground during a stoppage in play, and up a man, Dallas pushed forward in search of a result. The result finally came through two late headers -- one from Jacobson in the 88th minute and the other from halftime sub Walker Zimmerman in the 90th, scoring the first career MLS goal. 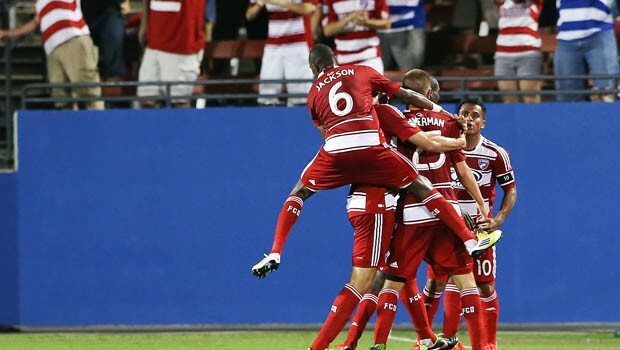 A strong Dallas side salvaged a point, while SKC made it four games in a row without a win. Real Salt Lake jumped over FC Dallas to take over top spot in the Western Conference (along with the Portland Timbers) thanks to a cool 2-0 win over the Seattle Sounders. The more dangerous side from the start, RSL took the 1-0 lead in the 40th minute when a deflected free kick fell to Kyle Beckerman, who fired a brilliant side volley past keeper Michael Gspurning. Then, just on the other side of halftime, Robbie Findley hit a shot far post from the right side of goal and RSL were sitting comfortably at 2-0. Still without midfielder Osvaldo Alonso, the Sounders struggled to create all night and managed just two shots in the entire game. RSL, meanwhile, are now unbeaten in five games after simply outplaying Seattle, who currently sit sixth in the conference and are still looking for consistency. A Conor Casey brace helped see the Philadelphia Union to a 3-0 victory against the New York Red Bulls that pushed them into second place in the East. Casey got off to a strong start, scoring a goal in the 4th minute that was whistled back for offside before heading home a goal that counted three minutes later. Down a goal, things got worse for New York in the 28th minute when Lloyd Sam earned a straight red for a two-footed, studs up challenge on Danny Cruz. Then, in the 36th minute, Dax McCarty scored a goal disallowed for offside, and the game remained 1-0 at the half. It took until the 64th minute for Philly to double their lead with a left-footed shot to bag Casey’s brace, and then Antoine Hoppenot sealed the win with an 89th minute goal off a Sebastien Le Toux assist. The win sends a strong message from the Union and raises yet more questions about a Red Bulls team that is still failing to live up to its on-paper potential. Don’t forget that the quarterfinals of the U.S. Open Cup are this Wednesday, June 26. D.C. United will face the New England Revolution, the Chicago Fire will take on Orlando City, Dallas will host the Portland Timbers, and Real Salt Lake will welcome the Carolina RailHawks. D.C. United broke their 13 game winless streak with a narrow 1-0 home victory over the San Jose Earthquakes; Chris Pontius got only his first goal of the season through a penalty kick. Speaking of streaks, the Portland Timbers are now unbeaten in 15 games after comfortably beating the Colorado Rapids 3-0 on Sunday. Chicago Fire defender Arne Friedrich has announced his retirement from professional soccer after struggling with injury. The former German international signed with the Fire in March 2012 and played a major role in the team’s defense, but a hamstring injury, followed by a hip injury, kept him from seeing the field this season. Chivas USA and MLS fans funded an LED plane display reading “Vergara Out” that flew over the StubHub Center during the SuperClásico between Chivas and the LA Galaxy on Sunday night. The message was in protest of Chivas’ owner Jorge Vergara, whose running of the club has been under fire recently. Toronto host Real Salt Lake to kick off the action, followed by Dallas at Philadelphia and Vancouver at D.C. The Colorado Rapids hit the road to take on the Montreal Impact, the Columbus Crew travel to Kansas City, and the New England Revolution visit Chivas. The San Jose Earthquakes host the LA Galaxy, and the New York Red Bulls welcome the Houston Dynamo to close out the weekend. Rodney Wallace. He assisted all three Timbers goals in the win over Colorado and continues to be a solid performer on Portland’s backline.